It was one of the oldest surviving murals in San Jose. 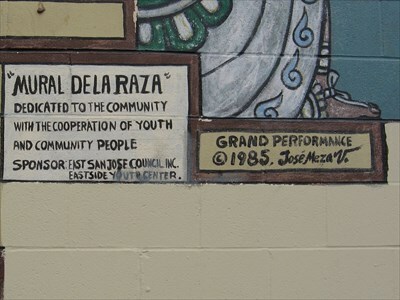 Painted in 1985 by an artist named Jose Mesa V. and an ensemble of East Side youth, the intricate wall art depicted the history of Chicano people, from the Aztecs of old to the laborers led by Cesar Chavez. The detailed pictorial covered the side of Payless ShoeSource at Story and King roads, the epicenter of the low-rider movement and the civil rights marches that spawned the United Farm Workers union. “Mural de la Raza” is gone now. Sometime before dawn Wednesday, a handyman slathered a thick coat of gray paint over every part of the panorama except for a small icon of the Virgin de Guadalupe. The next day, she disappeared, too, under the same drab veneer. Jose Valle says he’s heartbroken by the loss. The founder of Souleros Ball—a group that aims to preserve Chicano and indigenous culture—says the montage acquainted him as a kid with the faces of legends, revolutionaries, artists and activists that he would later read about in books: Pancho Villa, Emiliano Zapata and San Jose-raised playwright Luis Valdez. When Payless closed its East Side shop in 2017 after filing for bankruptcy, Valle and several other concerned residents began reaching out to the property management firm, CBRE, and City Hall. But the company stonewalled them. The office of Vice Mayor Magdalena Carrasco, whose council district encompasses the East Side, had no better luck. But activists say her office kept them out of the loop. Even if Carrasco’s staffers didn’t manage to reach the building’s owners, community members say they would’ve liked to know that some effort was made in the past year. Communication has improved now that the mural’s gone for good, they say. And while it’s too late for the Payless wall art, there may still be some recourse. On Thursday, Carrasco’s team met with Valle and San Jose’s Director of Public Art Michael Ogilvie to talk about how to respond to the sudden loss of the Mural de la Raza. Though there’s no saving the visual history and cultural way-finder, Valle learned that the community might have some recourse. Under federal law, the Visual Artists Rights Act of 1990, and state law, the California Art Preservation Act of 1979, muralists have some rights to the walls they painted. The overlapping statutes prohibit the desecration, alteration or destruction of public art without giving the artist at least a three-month notice. Valle and the city officials he met with today are unsure if the property owner did that—or if the artist is even alive. “We’re still trying to figure this out,” says Frances Herbert, the vice mayor’s chief of staff. She says the CBRE-managed property is in escrow, but she’s not yet sure who’s buying it. This morning, she plans to meet with the Santa Clara County Assessor’s Office to see if she can track down the person behind the LLC so she can send a legal notice about the rights of the artist—or, if the artist is dead, to his next of kin. Valle says he feels protective of the Chicano murals in San Jose, many of which have disappeared—including one that adorned the side of Chaparral Supermarket by Roosevelt Park. Though not an artist himself, Valle maintains a mural painted outside Pop’s Mini Market by an old friend, Frank “Pancho” Torres, who helped Mesa V. complete Mural de la Raza decades prior. The former First Lady is in town today to promote her new autobiography, Becoming, at a sold-out SAP Center appearance. Jose Mesa Velasquez, the artist whose East Side mural was painted over last week, says the property owner gave him no warning. What would have been a milestone for social justice advocates instead exposed deep divisions in the criminal justice movement. She doesn’t answer the phone, she doesn’t show up at community meetings (unless there is a camera or a ribbon to cut), she doesn’t send out notices, her newsletters are just pictures of her cutting ribbons, and she wants us to believe she tried for this? Carrasco is part of the same tired city council. SJ voters continue to show how stupid they are at the ballot box. Carrasco is a failure. The entire council are a bunch of self serving opportunists. She will pretend to care now that she has seen the backlash of this act. Another missed TV spot where she could have been the hero. Because no one cares about the other problems in the same neighborhoods ie broken down cars, Norteno vs Sureno shootings and motorhomes everywhere in front of houses with dirt lawns. Are you arguing that those two are the same thing? What about the fact CBRE have deleon money, which went to Carrasco? The “Ryland Train Mural” in my former neighborhood was “painted over” several times by graffiti vandals. Perhaps, if the “Ryland Train Mural” depicted “Chicano art” with illegal aliens riding on top of the train it would have received more city hall related attention. The destruction and or damage of Public Art hurts all of us as it brings down our city and civilization. @unrepresented, Vice Mayor Carrasco, and her office have been pounding the pavement since she was elected four years ago. She has held over hundreds of coffee’s, community breakfasts, policy lunch meetups, community meetings, and holds the largest National Night Out in the region. She is very accessible, as is her office. Her newsletter is filled with event announcements, as is NextDoor and the office regularly mails her constituents regarding events. She is one of the most active Councilmembers in the region. Then why did hubby deleon collect money from the realtor that went to Carrasco? Frances another shill puppet account for Carrasco. This has small town city of san jose written all over it. Chuck Reed, Khamis and Pete Constant used to do this too. SHANE are you out there too? I’ve just returned to San Jose after decade of living in SoCal and I’m devastated by the erasure of chicanx culture here. I grew up in that neighborhood and went on to college, study in Europe, and work for major tech and entertainment studios. That mural gave me hope and reminded me, a young Chicana from the east side, that I had greatness in my blood and I could accomplish anything. My father paid for my education- no hand outs- and we were never on wealfare. To this day my youngest brother is at UC Berkeley already he is losing his culture because of events such as this. That mural should have been preserved it was not an eye sore it was an important part of history. I saw this happen in LA, they are making way for the googles who will in record time turn poco way into luxury condos. In America, there is only one culture, American Culture and it is a good thing for you and your family that you are assimilating. In most countries, you would never assimilate even after many generations. Congratulations on your personal accomplishments, I wish you continued success! SJ KULAK. Please educated yourself, you are living on land that was Mexico. Educating ourselves includes valuing our history, our ethnicity and cultural practices. And guess what? They are American, but with a different slant. How long was it Mexico? What was it before it was Mexico? Ms Chicana – Perhaps you should get a bit of education yourself. When Mexico gave up California for a little over $18M after losing a series of battles to 660 men in 1847, there were roughly 8000 Mexicans living in California. Mexico, which did not make it a state for about 5 years after it’s War of Independence, considered it too far away and too difficiult to develop. However, within 3 years of Mexico signing the Hidalgo TREATY, ceding California to this United States (you know the one with the motto ‘e pluribus unum’), 142,000 Americans had settled California. The hard truth is that Mexico simply did not care about California. In the 150 years or so Spain and Mexico controlled California, they were able to develop it enough to support 8,000 settlers. In the 170 years or so the United States has included California, we have developed it to support over 39,000,000, that’s 4875 times as many people. As a result of this settlement California grew into the 5th largest economy at 2.7T in GDP, with all of Mexico coming in at 2.2T. Mexico, Spain, and Mexicans did not bother with California, did not settle it, did not attempt to improve it. It barely fought for it and sold it cheap. The value of California, and the reason so many Mexicans come to California and anywhere else in the US, is for the economy; evident in the roughly $28B in remittances, Mexico’s largest non-domestic income source. The California ecomony was developed by the settlers overcoming significant hardship and the United States government consistent involvement. It may be the most valuable plot of land in the history of the world, and Mexico wrote it off it for $18M. Now we welcome our friends from Mexico, certainly more than they welcome us Gringos. All we ask is you assimilate into our culture and from many we can continue to become one. H1bs trying to put up some bollywood crap in place….anchor babies! Bollywood crap? If anyone wants to paint a mural of Rani Mukerji or Freida Pinto, they can do it on the side of my house or on my living room wall! If an artist doesn’t own the property upon which he paints his mural, or isn’t given person to paint on it by the person who does own it, then it isn’t art, it’s just glorified graffiti. It is a shame the mural was painted over but perhaps Carrasco and the community who appreciate art and the mural’s history can replace it with another mural or murals elsewhere in the community. We definitely need more art and gardens in this area. I drive-by the Rancho Del Pueblo Golf course and I wish Carrasco would invest in this golf course. Perhaps something can be done there or elsewhere. It is unfortunate that opportunities for beautiful parks and art is never allocated to certain areas but always concentrated downtown. I have a nice mural in my backyard of one of Frida Kahlo’s paintings painted by a SJSU student for me. I hope the community can work with Carrasco to replace it and perhaps add more art to the district. Improving the parks in the area would also help. We have so much history that needs to be displayed. We as Mictlan Murals can help restore it. Message me on fb or ig. Thank you Raul. Please contact Carrasco’s office with your offer. I was just watching TV and saw a short segment on Italy street art that is being painted by artist on Italy’s new buildings or should I say modern buildings. Beautify murals. In my neighborhood of Spartan Keyes a new apartment building for the homeless will be opening in October and I am hoping we can convince First Community to allow a mural to go home on one of the building’s wall. Art is so important and I am hoping both the residents of the building and community can come together to work on the mural that will have meaning for the residents housed there and the residents in the neighborhood. Murals can also be done inside buildings. If there was a mural of Caucasians with the a footnote “the race”, how would it be received? Your are translating literally. So what if it means the race? It’s the equivalent of saying ‘mexicans “. Saying “bless you” when someone sneezes doesn’t mean you are literally blessing them. In Spanish, “adiós” translates literally to ‘with God’ but obviously it means goodbye. I know the intricacies of language are hard to understand but use your head just a little more. Now, before anyone blows a gasket about racist comments, let’s use Striving’s logic. The phrase, “That’s mighty White of you” is simply a pointed, biting criticism or sarcastic witticism which can be used by a person of any race and directed toward a person of any race and which means that the person to whom it is directed is both clueless and arrogant. It is generally used in a situation where someone has said or done something as a gift or a favor for which they believe they should earn thanks, but is so ineffective or was delivered in such a condescending manner, that they have instead insulted the person they are pretending to help. It implies that some white people may be, ahem, clueless and arrogant about the challenges other people face and of the cultural context of certain words and phrases. I am white. I have met many condescending, high and mighty White people. I was glad I finally found a phrase that describes it and which leaves them both confused and riddled with guilt whenever I have used it. “La Raza” is a term that can prompt a sense of fear and social unfairness (not unlike affirmative action) or a sense of pride in a heritage, race or culture. Now, does anyone speak German? Disgusted by the racist comments San Jose Inside allows on their blog. On another note, this County still celebrates, “Columbus Day”. Wow, another disgusting tale of “Silicon Valley”.